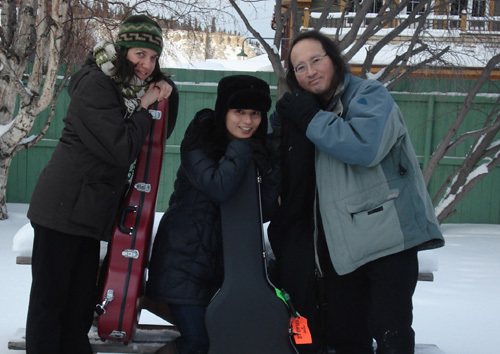 KIAC is pleased to welcome classical guitar trio PARTRITA to the Oddfellows Ballroom this Saturday Feb 4th. For those guitar players who are interested in learning more about classical guitar and boosting your chops, these three fantastic guitar players and educators will present an Intro to Classical Guitar workshop at 1PM, Feb 4th. This workshop will be $25. You must bring your own acoustic guitar to play on (any acoustic will do). The techniques presented here will translate to any style of guitar playing. What brought you to classical guitar, in particular? I was about 13 years old when I started taking classical lessons. Until then, I had been taking lessons for several years, from a few different teachers, studying mostly folk and country songs and styles (on a steel string guitar), when my teacher at the time said she felt I caught up to her playing level! She suggested I go to the conservatory to study classical guitar, because it would give me the chops to do whatever I wanted on guitar. She was right! I was immediately addicted. Any crazy gig stories? Stories from the road? Ha! A few, but they’re not really for public consumption. Who’s your favourite guitarist? Why? What’s a common misconception about classical guitar? That it is a 12 string instrument! What’s your favourite thing about playing guitar? feeling the guitar resonate, especially from low ringing bass notes. What do you like about playing in the trio Partrita? I’m inspired to become a better player and constantly challenge my musical & technical abilities. Previous post ← 48 Hour Film Competition wraps!